Six air conditioners (ACs) were bought among my family, friends and colleagues this summer. All of them consulted me before the purchase and all of them bought a 3-star against my advice for a 5-star AC. As outraged as I would like to be at them for being environment-insensitive, one can’t ignore the economics that tipped their final decision. 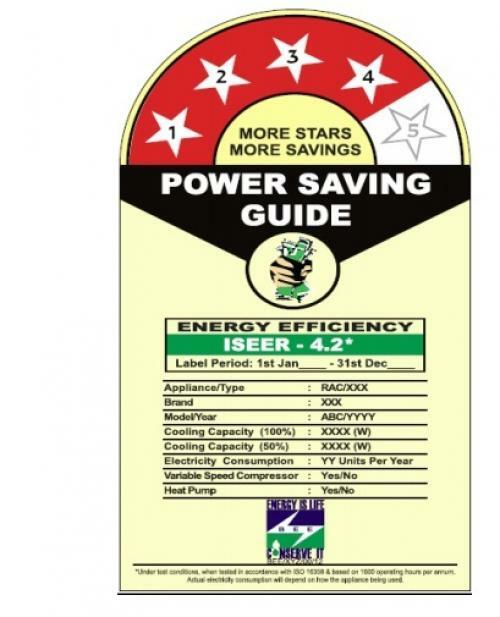 Indian Seasonal Energy Efficiency Rating (ISEER) replaced the old system for rating and labeling ACs with the onset of this year. One of the major aspects the new system—from the consumer perspective—is that the new star-labels display the amount of electricity that the given AC unit will consume in a year (see figure 1). This is a welcome change as it made the economic argument for investing in higher efficiency tangible for consumers. People can now calculate the payback and lifetime savings from their efficient-yet-expensive investment with ease by themselves. But this consumer empowerment initiative of the Bureau of Energy Efficiency (BEE) seems to be misfiring. All six people told me that after accounting for the information made available on the new label, they concluded investing in a 5-star AC makes no economic sense in the short- or long-term. In fact, one person informed that the sales-representative at one of the megastores explicitly pointed out the new labels, prodding him to do the maths himself while successfully pitching for a 3-star AC.The production data of the AC industry shows that it produced four 3-star ACs for every 5-star AC in 2017-18. 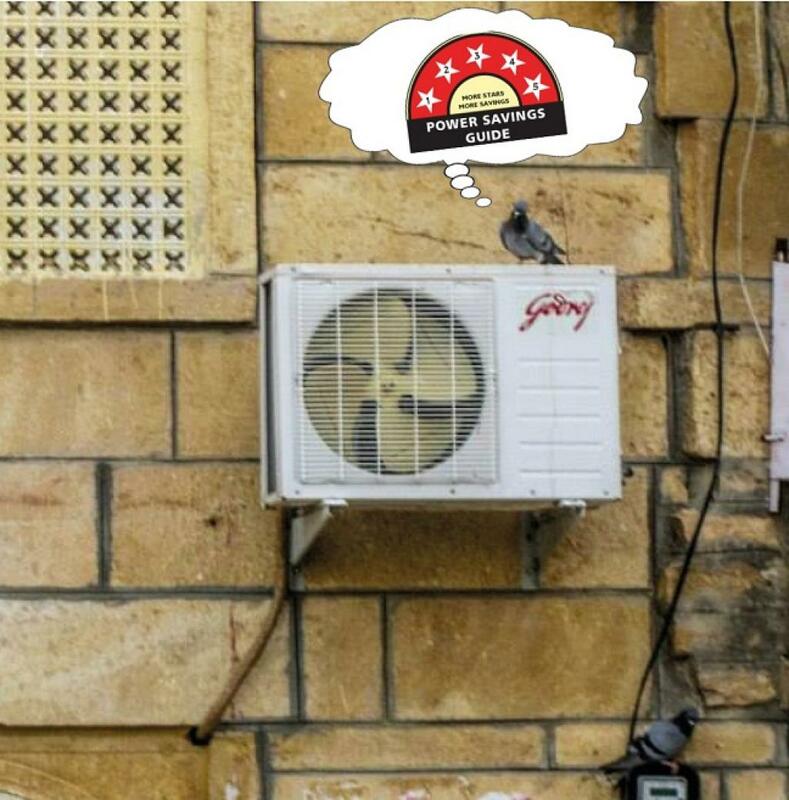 The maths is simple; star-labels are telling people that a 5-star AC on average consumes 120-150 units of electricity less than a 3-star AC annually. This annual saving can be translated to anywhere between Rs 180-225 (Delhi subsidised domestic rate) and Rs 930-1,162 (Delhi’s highest unsubsidised domestic rate) depending upon the electricity rate one chooses for the calculation. A quick survey of AC prices on online retail portals (Amazon and Flipkart) tells that a 5-star AC is at minimum Rs 8,000 dearer than its 3-star counterparts. The most optimistic calculation that can be conjured up is a minimum 7 years payback for the extra investment. But most people don’t do their budgets like energy consultants (highest electricity price and lowest cost differential between 3-star and 5-star). They base it on the subsidised rate they generally pay and that gives a stunning 35-45 years or longer payback. Keep in mind that the designed life of an AC is just 5-6 years. With such economics, no matter how educated a person is in matters of climate-change, investing in a 5-star AC will test their personal resolve for keeping their carbon footprint lowest in this sector. Frankly, if I ever decide to buy an AC for my home, going by this maths alone, I won’t buy a 5-star AC. This is pure madness. Is electricity too cheap in India? Are AC manufacturers unfairly pricing higher energy efficiency products? Or, is the calculation of annual energy consumption number displayed on the star-labels faulty? Most probably, it is all of these. Electricity and AC pricings are predominantly governed by politics and market forces and efforts are underway to fix these, but it is worrisome that the star-labels which are one of the tools designed for this purpose seem to be malfunctioning. ISEER is rooted in the fact that the same AC unit will have different energy bills in London, Dubai, Delhi and Chennai, as these cities have very different climates. Energy performance of an AC varies based on outdoor weather conditions. An AC will use more energy to cool down a room if outdoor temperature is 40 degrees Celsius compared to when it is 30 degrees Celsius. Removing more heat requires more energy. Therefore, to accurately estimate how much energy an AC would consume in a year it is important to factor in different temperature conditions it will be working in and for how long during a year. This is precisely what ISEER is designed to do. But the devil lies in the details. India officially recognizes the existence of five climatic zones in its territory. Logically, ISEER should have five unique formulations based on each climatic zone. But ISEER is based on an averaged-out climatic data from 54 cities, defeating the core purpose of being a climate-sensitive rating. The inclusion of Srinagar, Shillong, Kodaikanal and other not-so-hot cities in the ISEER mix makes the averaged climate way more moderate than the climate of cities like Delhi and Mumbai, where ACs are used. Further, ISEER is designed on the assumption that Indians start using ACs when outdoor temperature conditions get warmer than 23 degrees Celsius. This is an arbitrary assumption as there are no empirical consumer behaviour studies done in India to this end. A recent study by New Delhi-based not-for-profit, the Centre for Science and Environment, noted that the most people in Delhi don’t even start using ACs if the outdoor temperatures are 30 degrees Celsius or below. Putting this arbitrary consumer behaviour together with the water-downed climatic profile and questionable use of annual data instead of just the summer, ISEER concludes that the AC units will be running 70 per cent of the time when outdoor temperature is 30 degrees Celsius or below. In fact, less than 2 per cent of the annual operation is attributed to above 40 degrees Celsius conditions. ISEER seems like an effort to show lower overall consumption by ACs as to not scare away new middle-class buyers with the actual cost of operating ACs. And in this process of shrinking the energy footprint of ACs to increase their sales, BEE has ended up shrinking the advantage of 5-star ACs over the 3-star ones as well. Testing ACs for all possible outdoor conditions as stipulated in design of ratings can be a very expensive and time-consuming affair. Hence, for convenience, most countries require just enough tests that enable the use of statistical models to make reasonably accurate predictions. For instance, Australia, which has a rating program very similar to ISEER, mandates at least two tests for fixed-speed ACs and three for invertor ACs and uses results from them in a standardised algorithm to compute energy performance for the rest of weather conditions. Since the energy performance of the AC doesn’t have a linear relation with outdoor weather, it is deemed critical to have at least two reference points for any prediction model to work. Strangely, ISEER requires ACs to be tested only at a standard 35 degrees Celsius outdoor condition and then it just uses a black-box algorithm to simulate the rest of the performance. This not only defies basics of mathematics but also erroneously assumes all different brands, technologies, refrigerants available in market have the same performance gradient. Most probably, a very moderate, industry interest-friendly slope. In a recent conversation with a few experts who advised the government on the design of ISEER, I raised these concerns, only to be shut-out citing totalitarian nonsense that ISEER is beyond reproach. As for different climatic zones, it was deemed logistically impossible. 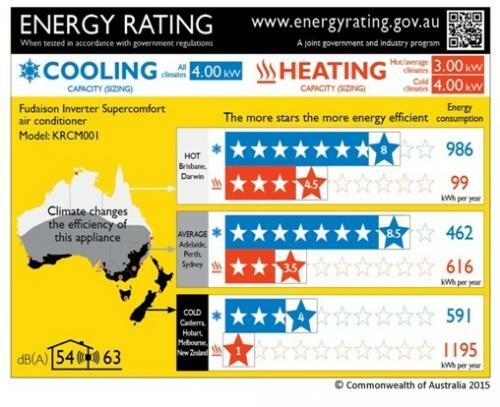 They refused to acknowledge that Australia already calculates its star-rating as per three climatic zones and displays all three on each star-label (see figure 2). This is important because an AC might be a 5-star in hot-dry climate but only 3-star in a warm-humid one as it might be not designed for removing humidity. Similarly, a 5-star for a warm-humid zone might be a 4-star in a composite and so on. People have the right to know what they are buying and how it may impact them, be it packaged food or ACs. It is the government’s responsibility to make sure correct information is being provided to us by the industry. Accuracy of this information becomes even more critical if the government is asking people to make costly investments based on it for the larger environmental and societal good. But it seems ISEER is designed to serve industry interest rather than consumer or climate interest.